“During the 2016 drought, my non-irrigated corn was yielding 25-50 bushels. My irrigated corn was getting upwards of 200 bushels. Irrigation ensures a market worthy crop for farmers and a reliable food supply for our poultry producers,” said AACD President Bill Bailey. Initially, $8 million will be available to eligible farmers through an application and ranking process. Through his work on federal appropriations, Congressman Robert Aderholt secured the funding. It is the first time in many years that funds will be available for new irrigated acres. Under current federal programs, farmers and landowners are limited to improving existing systems. “This will be a game-changer for Alabama. I think we’ll see the return on investment by next fall,” said Sen. Dial. 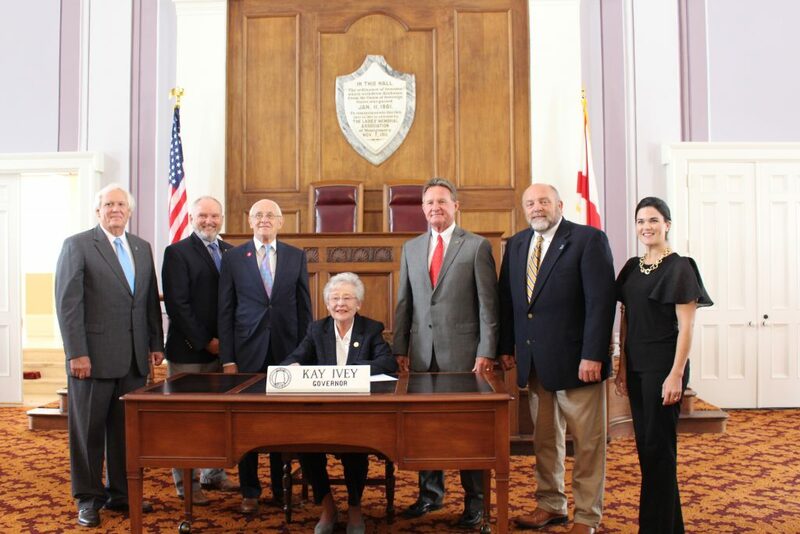 Charles Holmes, Bill Puckett, Sen. Gerald Dial, Governor Kay Ivey, Rep. Donnie Chesteen, Bill Bailey, and Katy Parker pose for a bill signing ceremony on May 21, 2018. The Alabama Association of Conservation Districts (AACD) is the unified voice of all 67 conservation districts across the state. Organized as a 501(c)(3), AACD is dedicated to cooperating with the Alabama Soil & Water Conservation Committee; supporting programs and services that conserve, enhance, and protect Alabama’s vast natural resources; and informing policy makers at the state and federal level about natural resources issues. Conservation districts work hand-in-hand with the Natural Resources Conservation Service (NRCS) to secure funding and technical assistance for landowners and farmers.